^ "Grand piano guide to Steinway and industry standard sizes", Bluebook of Pianos. Accessed March 12, 2010. ^ Katie Hafner: A Romance on Three Legs: Glenn Gould's Obsessive Quest for the Perfect Piano, Bloomsbury Publishing USA: New York, 2008, 1-59691-525-0 and 978-1-59691-525-1. ^ "Specifications and Features – Model D", Steinway & Sons Official Website, Accessed March 12, 2010. ^ "Just about perfect: The dichotomy of Steinway piano design", STEP Inside Design, issue of November/December 2003, p. 68. ^ "Mythos in Schwarz-Weiß, Wie ein Steinway-Flügel entsteht", Report of 5. April, 2010, by Norddeutscher Rundfunk (NDR) (in English: North German Broadcasting). ^ a b Ronald V. Ratcliffe: Steinway. Chronicle Books, San Francisco (USA) 1989, 0-87701-592-9. ^ [独自研究 by AxelKing] Private investigations, author of this information is hunting Centennial D information since 2010. ^ James Barron: Piano - The Making of a Steinway Concert Grand. Times Books, New York 2006, 978-0-8050-7878-7. ^ Susan Goldenberg: Steinway - From Glory to Controversy - The Family - The Business - The Piano. Mosaic Press, Oakville (Ontario, CDN) 1996, 0-88962-607-3. ^ a b "Steinways with German Accents...", The New York Times, August 27, 2003. Accessed March 25, 2010. ^ E.g. : Walden Woods, Steinway & Sons Official Website. Accessed March 12, 2010. ^ E.g. : Roger Williams Gold Piano, Steinway & Sons Official Website. Accessed March 12, 2010. ^ E.g. : Rhapsody piano, Steinway & Sons Official Website. Accessed March 12, 2010. ^ E.g. : Peace Piano, Tallahassee Antique Car Museum. Accessed March 13, 2010. 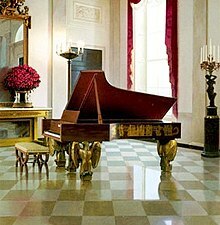 ^ "White House History Timelines: Musical Performances", The White House Historical Association. Accessed March 18, 2010. ^ "A Piano Is Born, Needing Practice; Full Grandness of K0862 May Take Several Concerts to Achieve", The New York Times. Accessed March 18, 2010. ^ Steinway & Sons – 150 Years, p. 65. ^ "A Piano Is Born, Needing Practice; Full Grandness of K0862 May Take Several Concerts to Achieve, p. 2", The New York Times. Accessed March 18, 2010. ^ "Laura Bush Hosts Preview Of White House Christmas Decorations", Life. Accessed March 18, 2010. ^ Prettejohn, Elizabeth (March 1, 2002). “Lawrence Alma-Tadema and the Modern City of Ancient Rome (Critical Essay)”. The Art Bulletin (Gale) 84 (1): 115–129. JSTOR 3177255. http://www.tandfonline.com/doi/abs/10.1080/00043079.2002.10787013. ^ a b "Alma-Tadema", Steinway & Sons Website. Accessed April 5, 2011. ^ Eight Keys to Buying a Piano – A guide to selecting the perfect instrument, p. 10. ^ "Sir Lawrence Alma-Tadema – British, 1836-1912 – Sir Edward John Poynter – Steinway & Sons", Clark Art Institute. Accessed March 14, 2010. ^ a b c Steinway & Sons – 150 Years, p. 32. James Barron, "Piano – The Making of a Steinway Concert Grand", Times Books, New York, 2006, ISBN 978-0-8050-7878-7.